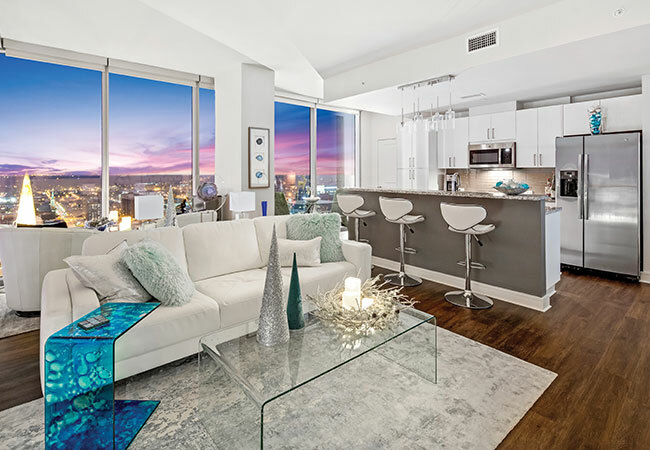 How do you dress up a dazzling downtown apartment with a killer view? 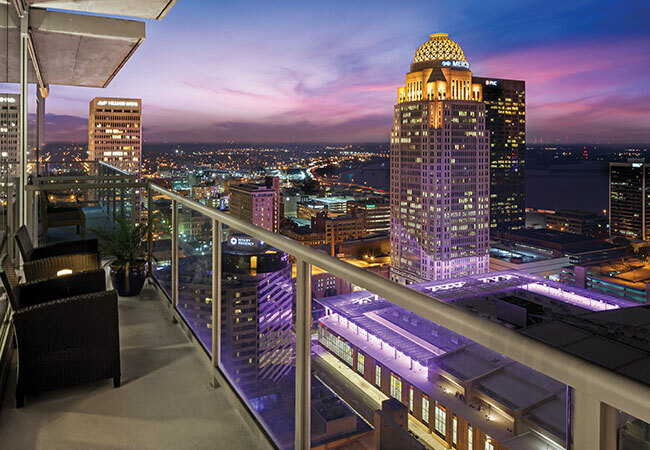 Omni Louisville residents Michelle and Neil Taylor invited us into their twenty-eighth floor apartment for a spectacular tour and a fresh vantage point on seasonal décor. 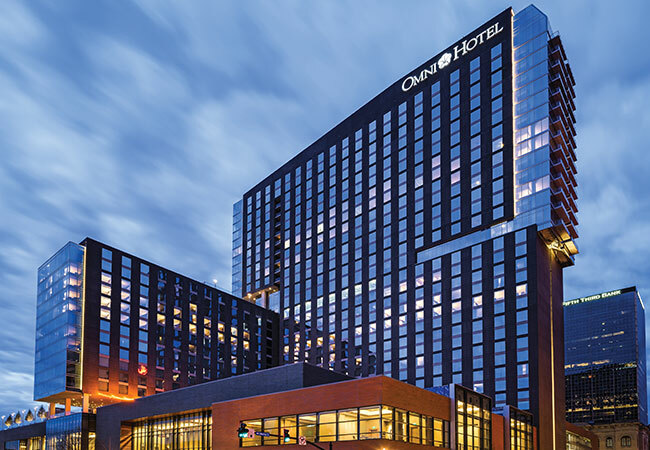 We were on a wait list for three years for the Omni. This was even before the building process had started! 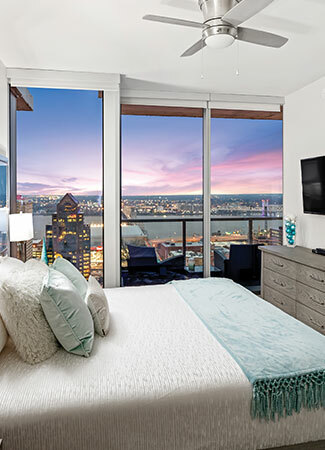 The beautiful cityscape beyond their floor-to-ceiling windows was a center piece of the design. Kristine implemented a variety of seating areas that capture the incredible views from the windows that frame the living room. Modern leather swivel chairs flank a round cocktail table giving a front row vantage point of the downtown landscape. The buttery, white leather sofa is paired with a glass waterfall coffee table offering another place to unwind. 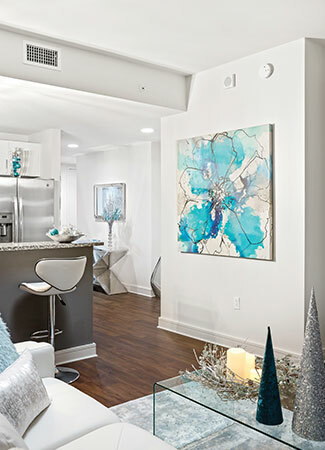 Splashes of cobalt and aqua, silver textures and mirrored surfaces blend well with the skyline. 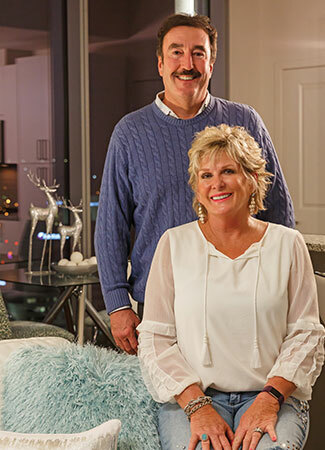 “I wanted the décor to accentuate the view not detract from it, so using light, airy upholstered furniture anchors the space enough without weighing it down,” Kristine shares. She used a similar approach when helping the couple decorate their home for the approaching holiday season, infusing subtle yet sophisticated decorations that don’t take away from the focal point, but add a festive touch to the space.